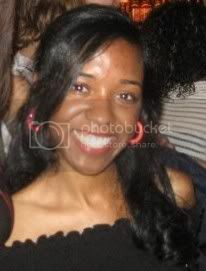 I am thrilled to be introducing PennylanePapers.com to my readers once again!! I did a giveaway from this fabulous company back in January and the response was wonderful. When Patty contacted Pennies In My Pocket to invite me to view her site, I knew I had to share PennylanePapers.com with everyone. You know who will love this store? ... moms and dads who are constantly jetting to birthday parties and spending a small fortune on what gets tossed in a few minutes - the gift wrap. 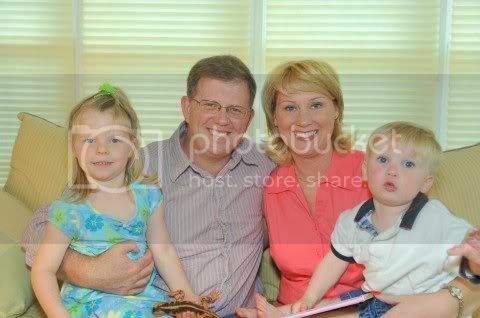 PennylanePapers.com is every mom's (and dad's) answer to this problem!! This is where it gets real good - Drum roll please ....... EVERY bag (and tissue paper, too) is ONLY $1!!! Now, do not think for a second that the quality is compromised because of this steal of a deal. I received two of the bags and the quality is shocking...definitely worth much more than a buck! Many of the bags at PennylanePapers.com have special details such as ribbon handles, glitter accents and peek-a-boo windows. Shopping for an event other than a child's birthday? You're in luck - there are bags to cover any of life's special occasions! Browse PennylanePapers.com and pick out your favorite bag. Describe the bag in the comment. The bag you list will be one of the ten bags you will win! Entries will be accepted until Tuesday, Oct. 28, 2008 at 11:59pm PST. Double Your Entry: Blog about this contest in your blog with a link to it. Include the url to your blog in your entry comment for verification. A winner will be randomly selected and announced as well as multiple alternates. The winner will also be contacted if contact info is provided. The winner will have until Sunday, Nov. 2, 2008 11:59pm PST to claim the prize by emailing his/her full name and mailing address. If the winner does not respond by the given date, the first alternate to email his/her info will receive the prize. Am I the first one? How did THAT happen? PS... I found a Wii for christmas through a friend's Ebay page? Do you give out head's up for things like that? I'm excited anyway! I like the purse bags and the wavy bag. TRIPPY! love any of the little purse giftbags. perfect for the many tween/teen birthday parties my gilie is going to be attending this year. These rock! I love "Waves". It's nicely gender neutral! I think I like the little monkey bag it reminds me of my boys. The purse gift bags are too cute = what a great site. Even though I lvie in OZ I do online shopping for most things now! Thanks for stopping by my blog to - appreciate your comment! Oh my gosh! These bags are so cute! I am sooooo entering!!!! And if I stop being a lazy blogger I'll hope to get around to posting about it on my blog! Lol! I adore the waggin' heads animal gift bags for kids. They are so cute. I can't decide between the cat or the lion, oh no, do I really have to pick just one? Ummm...uhhh....ok ok, I pick.....THE CAT! Just wanted to stop by and tell you congrats on being first on SITS this morning! Good luck to everyone entering the contest. I love the Wagging Head Monkey Bag...sooo cute. I love the wagging head gift bags, especially the dog. I love the floral bag...so very cute! The stripe one is really nice too...but I am all about "floral"
will put you on my blog today too! Love all the stuff!!! Love the diamonds gift bag!! These are wonderful. My favorite is the pink and orange purse gift bag. My little granddaughter would love that one. This is a super cute site! I love the floral gift bag, perfect for a ton of diff occassions! So cute! Thanks for the link to the site! I really like the circles and squares bag. Thanks for sharing this site! I am definitely bookmarking it for future reference. I know I told you this before, but I really love your blog! I love the purse bags they are way too cute. Good stuff! I like the one with the polka dots on it! They're all cute though! Wow! great site. I had a hard time choosing my fav bag. Guess I am torn between the Frog Glitter Critter and the Floral Gift Bag. Thanks for the giveaway. Will be posting on my blog today. Ok I super Love your blog. Great deals daily, unreal. Now cute bags for a buck?!?!?! I love love love the polka dots and purse bags. I cant pick! Blogged about your giveaway today. I forgot to ask did you try my spanish rice recipe last night? I like the diamonds gift bag! They are all too cute though and what a wonderful price! I'm new to SITS and thought I would come say Hello! I HAVE TEENAGE GRANDAUGHTERS AND JUST LOVE THE PURSES. THEY ARE ALL TOO CUTE TOO PICK OUT ONE SPECIAL. ANY ONE OF THESE WOULD FIT THE OCASSION. I love the "Floral Gift Bag" with flower and heart illustrations! This is jaden from bendyruggles and my favorite bag is the wavy bag! I LOVE the purse bags!! Those are sooo cute!! What a fun store! I am ALWAYS using gift bags! Our family is so big its always someones birthday (my mom's tomorrow! ), or anniversary, or babies, weddings, you name it, it's happening! Thanks!! I love the wagging head monkey bag! Awesome site and great giveaway!! I love the kid gift bags! They are so cute. Considering all the boys I have to shop for I think the Waggin' Head Lion Gift Bag is great. i like the wagging monkey bag and the wave bag...cute! I really loved the Kaleidoscope gift bag......and the Wave, I can't believe they are only a dollar! Hey Mel! Love the purse giftbags (lots of play after opening the gift! ), the waggin' monkey head bag (reminds me of Jase - he probably wouldn't want to give it away! ), and the circles & squares.....I know you said just one....I can't follow rules very well HAHA! The Waggin' Head Monkey Bag is so cute! My nephews would love it. I love the waggin head Doggy and Monkey bags. I could not pick the one favorite! Do the heads really wag? I could not tell from the picture, lol~ I have seen where the picture moves because it is connected to a spring on the bags before. Either way Super cute and Super Cheap what a steal!! Happy Tuesday (it is Tuesday isn't it?). Wow, $1 gift bags, that is a bargin! I love anything bright and colorful so one of my favorite bags would be the squares and circles bag. Nothing says there is something awesome in this bag like a little bit of color! That is amazing that they are only $1 I love the pink and yellow purse gift bag...those things are awesome!!!! I love the waves gift bag the most. This was hard because I really liked all of them. I like the Waggin' Head Dog Gift Bag!!!! That Waggin' Head Monkey bag is too funny! Love this site!! Okay!! I love the wagging Monkey head one. We always call my son our little monkey so this would work for his birthday!! What a GREAT SITE! Thank you for introducing it to us! What bargains! !My favs are the Floral ones. The one with all different shades of pink and the one with pink, yellow, green. Love them! I like the floral gift bag best. Thanks for offering this contest! These rock! I love "Waves"
What beautiful, beautiful bags!! I love the Circles & Squares Gift Bag and the Waves Gift Bag. Thank you so much for offering this giveaway. I love the Purse Giftbag with orange, hot pink, lavender and yellow squares. I love the Purse bags! They are all cute! I like the purse bag but all of the kids ones are fun! I like the frog glitter twitter bag! my grandsons love alligators so it would have to include the Crocodile Glitter Critter Gift Bag..
oops email addy above is wrong! How fun! Who doesn't need a few gift bags? I like the Wave Gift Bag the best. I love the purse giftbags...especially the Petite daisies, along with a marabou accent one. Too cute!! It has a green solid top and colored diamond tiles all over the rest of it. Neat giveaway! I like the party hat gift bag! Cute stuff. oh any bags with snowflaes and sparle....and hints of lue and red!!!! My favorite is the Frog Glitter Critter Gift Bag. What a great site! My favorite bag is the 2-tone orange and pink bag. The 2-tone bags are simple, but stylish and great for any occasion! Ok I totally dig the wavy baag I think it is pretty groovey ! Thanks for hosting! My favorite is the birthday dots gift bag. It'd be nice for male or female, adult or child. Birthday Cupcakes bag is cute. Simple and good for any party. The Lime green, yellow and dark green purse gift bag is one of my favorites. 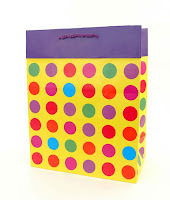 The Circles & Squares Gift Bag with the bright colors and circles and squares would be perfect for any gift! These are super cute and a great price! I love the yellow and pink polka dot purse bag! Too cute! I love the blue floral gift bag. I'm a big fan of the blue and green two tone bag since they're my favorite colors, but really, all these bags are so cute :) Thanks! I love the crocodile glitter gift bag! i'm always in need of gift bags! my fave is the floral gift bag in "blue". those would be perfect for both boys and girls...and it's so hard to believe they are only $1! The Blue Floral Gift bag is really nice! Thank you. I love the Baby Boy gift bag! I love the diamonds gift bag because it reminds me of a kaleidescope. So fun! I like the Circles & Squares Gift Bag. It is fun and bright and can be used for anything!! I've missed so much being gone for a few days! Love this contest because I go through gift bags like water! This site is amazing. I'm going to go order some and keep them in my gift closet. I can't believe they are a buck! The tissue paper is such a great deal, too! My fave has to be the purse bags. Adorable! I'll come back when the contest is over to see if I'm the winner. Thanks, Melody. Great contest! I love the stripes great for all occasions! Great site... love, love, love it. I've saved you to my favs! I love the lion bag - my baby does love him a lion! My favorite bag is the Kids monkey bag, It's so cute. Okay, yes, I picked a kids one, but that is because I'm a kid at heart. I love the floral bag and the stripes are great! Thanks! I especially like the Two-Tone Gift Bags....my favorite is the hot pink bag with orange top. I meant to enter this sooner. Here is my choice: Birthday Cupcakes bag. Thanks! I love the "Waggin' Head Monkey Gift Bag". You have a great blog - I love it! I love the Wave gift bag! It seems like so many bags in the store are only for girls or are so blah, but the description is right...Wave bags would be perfect for guys or gals. I LOVE the purse bags...especially the blue orange and yellow dot one! I love the Frog Glitter Critter one. I collect frogs! Great giveaway! That site is amazing! I like the purse gift bag! I like the Peek-A-Boo gift bag in yellow, for babies. The clear window is a great idea! I like the wave gift bag, very groovy! My favorite is the Diamonds Gift Bag. I like the color combination with the different shades of blue and greens with red diamonds thrown in. i like the circles and squares bag. These are great and only a dollar. My fave is the Baby Bottle Gift Bag. I love the polka dot "purse" bag and the monkey bag-hard to choose!! Love them!! Great giveaway~thanks. Love the Circles and Squares one. Definitely the polka dot bag! I've love all 10 to be that it's so cute! This is great!! I love the blue and lilac diamonds gift bag. It would work for male or female. Love it! I like the Waggin Head Dog gift bag. Cute for dog lovers! I like the wave gift bag and aso the polka dots. Birthday hats gift bag was my fave I really like that it is a unisex gift item! It's a toss-up between the Waggin' Head Cat and Dog gift bags--I can't choose! I just love the Waggin' Head Dog Gift Bag. That is adorable! Thank you so much! I like the all the two toned gift bags. I love the polka dot purse bag!! I love to make gifts and I run out of bags often. The Birthday Hats gift bag is great - so festive and fun! Both children and adults alike would be thrilled to receive a gift in that bag! I like the birthday candles bag because you could use it for anyones birthday! I like the Birthday Candles Gift Bag. I love the Purse Gift Bag with pink and orange flowers. My favorite is the light blue purse with the flowers. Thank you!!! I like the stripes bag because it can be used for both men and women, for most occasions, and comes in two sizes as well. I like the daisy purse gift bag, the diamond gift bag and the wagging head bags! So hard to pick just one! I love any of the purse bags. So cute and my daughter has plenty of birthday parties to use them! I'll check back when the contest ends. Melody, you of all people know I am just a sucker for some polka dots! So naturally, I picked the polka dot bag :) And of course I wrote a blog posting! I love the monkey gift bag. Who can resist the purse bags that are covered in polka dots (orange, hot pink and lavender)?! With tons of girly girl parties to go to, this would just be fabulous! My favorite is the Stripes Gift Bag. Cute stuff! My favorite is the floral wedding giftbag. The Orange gift bag with the lime green cuff is my favorite - perfect for any occasion! I like the purse gift bag with orange, hot pink, lavender and yellow squares. It is super cute! I love the floral bag with the Yellow, pink and green. It's perfect for a baby shower or a little girls birthday party! I especially like the multicolored Circles and Squares Bag that coordinates with the yellow or blue tissue. Pink Floral Gift Bag is my favorite! Love the purse bags...and the Frog Glitter Critter Gift Bag is too cute. Thanks! I like the 2 tone gift bags - perfect for every thing! circles and squares is my fave, thanks you so much. I really liked thetwo tones, but I think the Wave looks the coolest. Great give away, I'll keep my fingers crossed, thanks you. Floral gift bag in the blue and or pink look food. Great giveaway, what a bargain, I'm off to research their shipping costs. thanks very much again. I like the Waggin' Head Cat Gift Bag. Very cute! Let's do the Waves. I've always liked variations of blues. All the bags are too cute! My fav. is the purse bag with the frilly pink handle. The bag has squares with circles all over it. Could the purse bags be any cuter..I love them all..i wish i had them for a 30th b-day i am going to tomorrow! I actually need gift bags really badly, I love the purses & the Giraffe Glitter Critter Gift Bag. I love the blue, green, brown wave bag. It's lovely. I like the Waggin' Head Lion Gift Bag! the circles and squares are fun! I like the blue purse gift bag with yellow tissue. THE WAGGING HEAD MONKEY BAG, HOW CUTE IS THAT?! I love the Floral Gift Bag. What a great selection at great prices. I love the hot pink and orange Two-Tone Gift Bag. My favorite bag at Pennylane Papers is the Floral Gift Bag (Posies are perfect for so many occasions. Pink, yellow and green tones, matte finish.) :) *Thanks* for the giveaway! My favorite bag is also the Everyday Bag, Polka Dot. Love it! my favorite is the Purse Gift Bag in Lime green, yellow and dark green. I love the daisy purse bag! It is sooo cute! Wow, it's hard to just pick one favorite. I LOVE the Baby Shoes Gift Bag (with real laces!). The Floral (Flower and Heart Illustrated) Everyday Gift Bag is also very nice. I'm definitely headed back to Pennylane Papers to purchase some gift bags. You can't beat the prices! Great giveaway!! Wow, I can't believe these are only $1? What a deal! I really like the Circles & Squares Gift Bag. Thanks! I like all of the purse gift bags, especially the blue one. She has cute bags with great prices! You have to pick me! Love them. I love the purse gift bag. The yellow and blue reminds me of bubbles. I love the orange and yellow polka dot purse bag. They are all so cute! I love the baby bottle one! That is so cute! I'm heading back there now to check out your S&H prices! I love the Waggin' Head Cat Gift Bag! Too cute. OMG I love these bags!! My fave would have to be the blue floral gift bag. Those are soooo cute. I LOVE the wave bag. These bags are the best and the price is unbelievable. What a great thing to keep on hand for that last minute gift. If most are like me I usually wait until the last minute to wrap my gifts and then I realize that I have forgotten something. This way the tissue and everything is included and no last minute panic attacks. Fantastic idea and one that I would love to win. Thanks for the consideration. i like the kids polka dot purse gift bag! what a great selection! I like the Purse Gift Bag that has yellow, orange and light blue circles along with a yellow marabou accent. Thanks for having the contest!